For over four years, Republicans have thwarted democracy, using archaic filibuster rules to bring the Senate to a standstill. 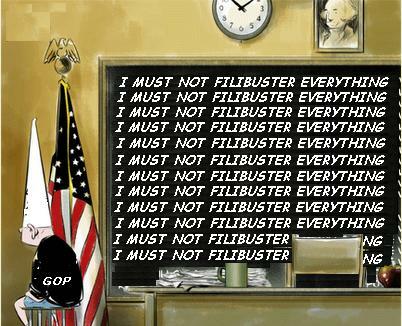 This abuse of the filibuster is unparalleled in the history of the United States. Led by Republican Minority Leader Mitch McConnell this cynical strategy has blocked genuine Wall Street reform, a public option for health insurance, and universal background checks for gun purchases, but its most outrageous abuse is denying President Obama his nominees for the courts and to run the government. Next week, the U.S. Senate will take up the nomination of Former Ohio Attorney General Richard Cordray as Director of the Consumer Financial Protection Bureau. The bureau, Sen. Elizabeth Warren's inspiration, has already done remarkable work protecting Main Street from Wall Street during its short existence. Senate Majority Leader Harry Reid finally seems ready to lay down the law and force a change in filibuster rules to confirm Cordray. California's Senators have got to have his back. Tell Senators Dianne Feinstein and Barbara Boxer: "Stand up to the GOP, make the Senate do its job, and restore democracy by supporting Majority Leader Reid in his attempt to change filibuster rules."